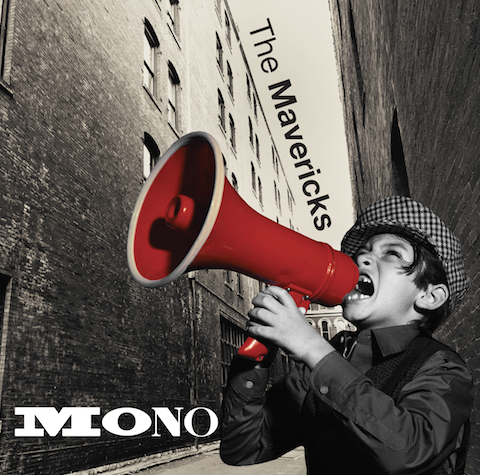 The Mavericks are back with their supposedly sophomore album, Mono. Why, supposedly? Well, for a band that’s been around for 25 years, they’re hardly new in this game; if anything, their return to the scene in 2012 and with the release of In Time, they basically took off from where they left off. And Mono shows just how much more creative they can get, and with the full support of their record company, The Valory Music Co.
Why Mono? Some of my fellow Mavericks fans who are non-Latino were running the online translators trying to find out what their tour title meant, Mono Mundo. The vast majority asked, “Monkey World?” Well, Mono isn’t Spanish; if anything, it’s short for monaural; or, monophonic. In other words, not in stereo, or sound reproduced through a single (one) channel. The sound is simpler, more basic, but the music is all Mavericks. It’s a risk few are willing to take, which makes this album much more exciting. Most impressive is that The Mavericks recorded this album in a week, recorded live, and with few overdubs to sweeten the sound. Still, the various instruments that make up the Mavericks sound are captured beautifully. From the get-g0, the bilingual Latin-tinged All Night Long soars, along with Raul Malo’s vocals. And speaking of voices, the R&B tune, What Am I Supposed To Do, with its beautiful harmonies, has become a fan favorite as the Mavs tested out several of these songs at the end of 2014. A personal favorite of mine is (Waiting) For the World to End because the lyrics are fantastic. The clash of horns and instruments, though, make it one of the more powerful tunes on the album. As Raul Malo is quite the balladeer, Fascinate Me, gives him quite the workout as he reaches for uncharacteristic highs that few can achieve. The piano and acordeón accompaniment and horns come together awesomely. The Mavericks, as always, go in different directions while staying true to their sound. Let It Rain is a folksy tune with Michael Guerra’s acordeon clearly audible. The blues tune, The Only Question Is, gives Malo another workout that is very appreciated. The rockin’ Stories We Could Tell and What You Do To Me will keep fans dancing in front of the stage. As a bonus track, they give us Nitty Gritty, made popular by Doug Sahm. 12 tracks–all awesome. Get yours today! As always is the case with The Mavericks, you get de todo un poco (a little bit of everything). The Mavericks are about to embark on their Mono Mundo Tour (that’s One World), taking them across the US and Europe. They hit Houston on April 16, and I’m hoping they give us another 2 hours and 45 minutes of awesome. This entry was posted in 2015, Cultura, Reviews and tagged michael guerra, mono, raul malo, the mavericks. Bookmark the permalink.